I have been publicly blogging for four-ish years. If someone asks me, ‘should I start a blog?’ I will blurt out a bold and sparkling ‘yes!’ before they even finish the sentence. After all I have been known to harass my Facebook friends to start some kind of social media feed for their little nuggets of hilarity and insight. No matter who, what, or where you are, you have an audience and you have something to offer. Now you just need a place to put it where people can find it and easily access it. Most of the ‘original’ bloggers used their space as an online journal to keep their families up to date on their life. Blogging was really all about the blogger’s life and thoughts. It was about them, by them, done whenever and however they chose. Then blogging went through this weird period where the word would get clumped up in peoples’ throats. More people were becoming bloggers every day but the mainstream wasn’t quite sold on it being a ‘thing’. Now blogging is all about what you can offer someone and how you can bring value to their lives. Bloggers are called titles such as writers, social media influencers, story tellers, infopreneurs, coaches, creatives, and so on. 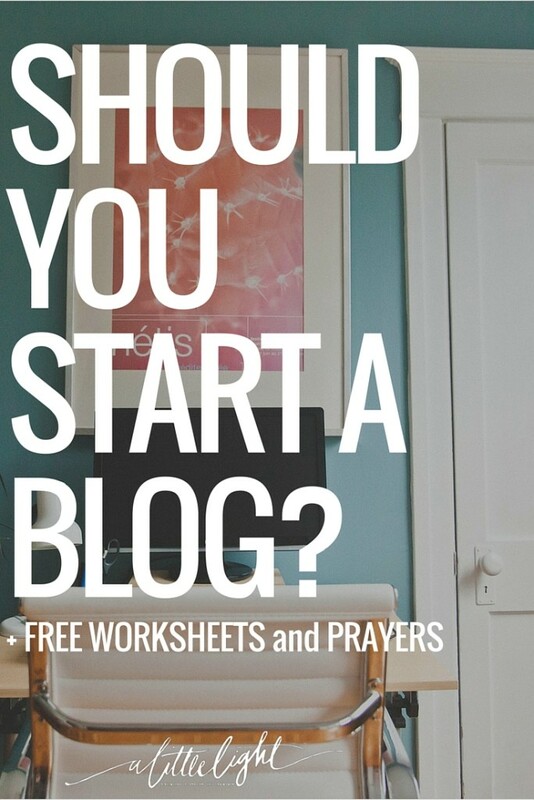 If you are thinking of starting a blog, I encourage you to really listen to that voice. If you feel God is calling you to share something, I encourage you to be obedient and brave – even when you don’t understand where it is going or why. If you don’t feel ‘called’ but are passionate about, I encourage you to pursue it and honour the drive in you to take it on. For me, blogging has changed my life. I started as a new mom who wanted to share the disappointment that I was ashamed to admit I had about my c-section. Blogging became a ‘hobby’, it was always there as something to do when I had the time. It was also reshaping how I was viewing my life in my new role of stay at home mom. 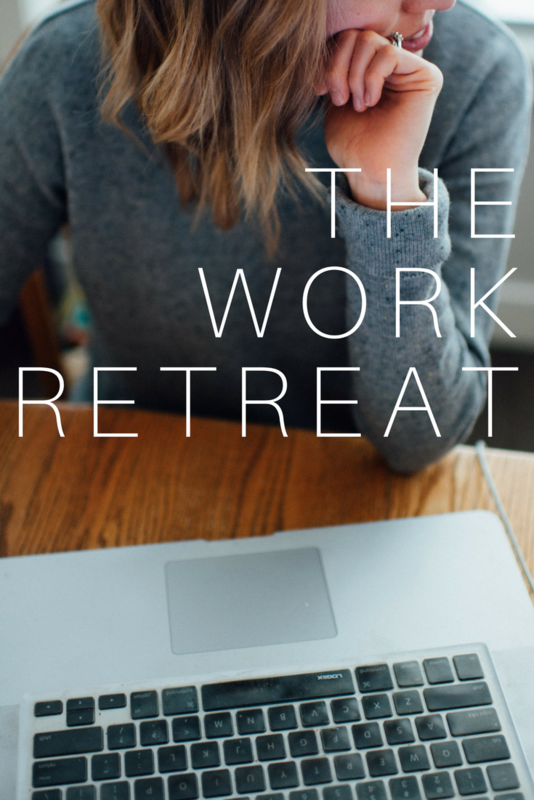 As my friend, Jac, has said – instead of walking around the house thinking about all the things I had to do as a stay at home mom now I was thinking about things to write (ample paraphrasing by me). Blogging has become my career. It has brought me new close friends. It has helped me grow in ways I didn’t expect, but most definitely needed. There is power in writing. The process of blogging magnifies how we see ourselves and our relationship to the world. Writing will unearth things you didn’t know were there and sculpt away parts of you that no longer belong. Anyone who has ever kept any kind of journal or thought-lists knows this is true. The aspect of putting these ‘writings’ out into the online world where they would be at the mercy of public opinion is humbling. There is no confidence going into something like blogging. When you press ‘publish’ you will always, always doubt yourself. But you do it anyways, and your confidence in your voice grows from it. If you are writing authentically then blogging will lead you towards what you truly want to say and help you find the courage to say it even when it makes you vulnerable. Writing is the cornerstone of making a great blog but it has become just one of many elements to blogging. If you run a blog then you also have to hire or run your own social media accounts, website maintenance, graphic development, post promotion, reader interactions, signing autographs, kissing babies, going to amazing conferences, and accepting your Okayest Stay at Home Mom Award!! Blogging does come with its drawbacks. You are tied to social media in a way that can quickly become overwhelming. You will be taking time from your family to do something they don’t quite understand. You will feel the pressure to constantly ‘produce’ content. All of this is part of the sacrifices we make to do something we are called to, love to, need to do. If you have felt that calling to develop your online space then pray for guidance, pray for courage, pray for your motives. Lives are being changed by the images and stories being shared in the online world. You have the opportunity to be part of furthering God’s kingdom in a strange way, a very real way, your own way. 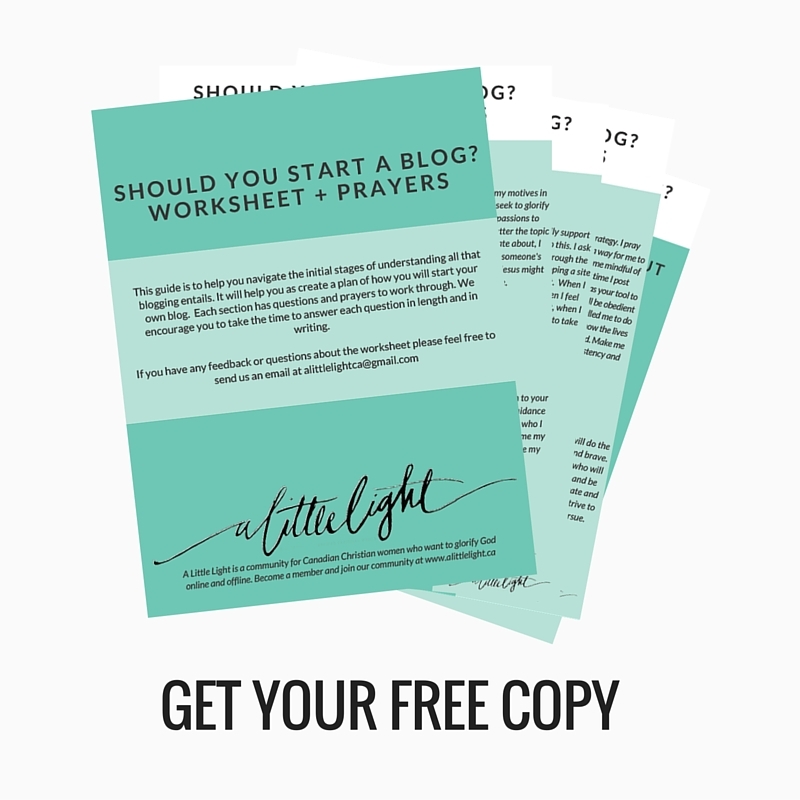 If you are thinking of starting a blog or website then we have a free guide with worksheets + prayers to help you in the process. (click image above for download). 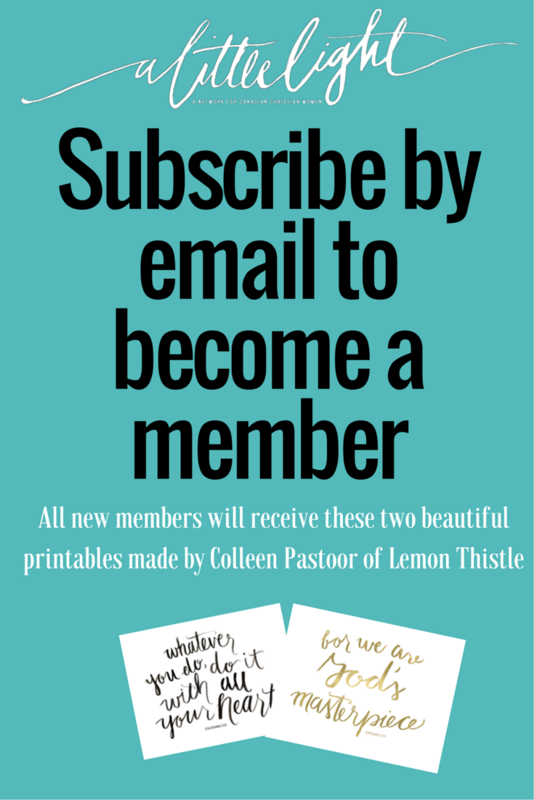 A Little Light is a community for Canadian Christian women who want to glorify God with their online and offline lives. 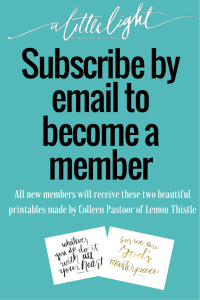 If you would like to join the community, subscribe by email below. Thank you so much for providing these worksheets. I’ve been wanting to start a blog for some time now but the self doubt always came up. I find that these worksheets really help to check my motives and really help me to see if I really want to do this or just liking the idea of it. Thanks again.